DBA is short for "doing business as." Sole proprietors and even larger companies may elect to operate under DBAs or fictitious names for a variety of reasons. DBA registration forms are filed with the County Clerk or Secretary of State for the state in which a business is located. Because the filing procedure is different in every area, the requirements for filling out DBA forms vary, although most forms require similar information and can be filled out in a matter of minutes. Obtain a DBA registration form for your jurisdiction. You should be able to obtain this form from your County Clerk, or Secretary of State in states that handle DBA filings at the state level rather than through the county government. Fill in the required information on the form. Typically, this will include your name, address, city, state and ZIP code. Confirm that all information is entered correctly. Write your DBA or fictitious name on the form. Generally, you cannot use a DBA that is already being used in your state. Perform a thorough name check through your county or state website, or consider having an online legal document preparation and filing service help you with this task. Write the address of your primary business location in the designated space on the form. Some jurisdictions do not allow the use of post office box addresses, so you should be prepared to provide a physical address. Specify your business entity type on the form. The choices typically include sole proprietor, partnership, LLC or corporation. Provide any other information requested on the DBA form. In some areas, you'll be asked to provide a brief statement describing your company's products or services. Some states require you to disclose any previous fictitious names for which you have previously applied. 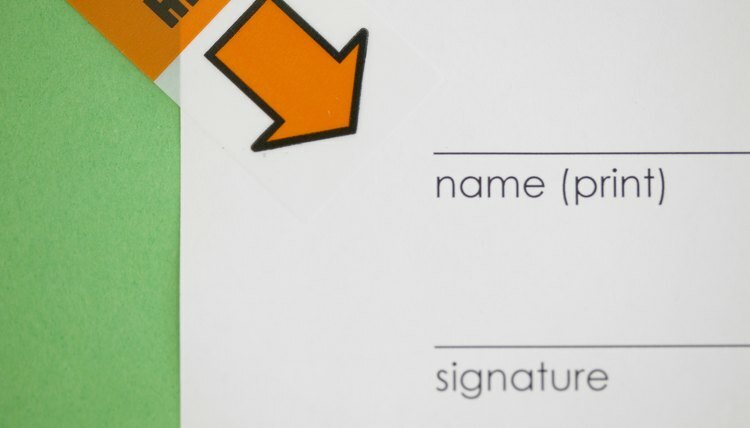 Sign and date the form. Your state may require that you do this in the presence of a notary. If you want to do business under any name besides your legal given name, you need to use a trade name, also known as a "doing business as," or DBA, name. For example, if you want to call your delivery service "Mere Minutes," you have to register that name. In Massachusetts, the state doesn't handle the registrations of business names for unincorporated businesses. Instead, you must register the name in each city or town where you will do business to receive a "doing business as" certificate, which is renewable. Be sure to note the expiration date of the certificate and renew as indicated. In Idaho, you can operate your business as a sole proprietorship -- meaning there is no legal difference between you and your business -- or under a formal business structure like a corporation or limited liability company. Whatever business structure you choose, you must operate your business under your business’s legal name unless you file a Certificate of Assumed Business Name with the Idaho Secretary of State. When registering a limited liability company, or LLC, with a state business registration entity, an individual must provide a legal name for the LLC. In addition to a legal name, an LLC may also have a fictitious business name. A fictitious business name, also referred to as a “trade name,” “DBA name” or assumed name, allows an LLC to use a name other than its legal name. By using fictitious business names, one LLC can be used to operate multiple businesses. While the method of registering a fictitious business name varies by state, it generally involves filing a fictitious business name registration with either a state or county agency.